Each year, USDA's Pesticide Data Program publishes data on pesticide residues, principally in fruit and vegetable crops, selected in part because of their frequent consumption by children. It is difficult to know how worried consumers should be about the results. Here are some thoughts and questions on the most recent 2008 residue detections for fruits and vegetables. For some pesticides, EPA sets safety tolerances for the maximum amount of residue that should show up on food. For other pesticides, EPA sets no tolerance, meaning that there should not be any residue of that pesticide at all. First, we look at data on total residue detections. Many fruit and vegetable samples have multiple pesticide residues, but the amounts may be small, usually far within the Environmental Protection Agency's safety tolerances. Let's say for the moment that we are not very worried about these total detections, but instead want to know about detections that violate EPA standards. Second, therefore, we look at residue detections that exceed EPA's established tolerances, for pesticide uses that have a tolerance. These detections are more worrisome when they happen, but they do not happen very frequently. Fewer than 1% of samples had this type of residue detection exceeding an established tolerance. Third, we look at residue detections for pesticides that have no EPA tolerance. The lack of a tolerance may mean that the chemical is judged to be of greater safety concern. The USDA found many such residue detections -- almost 5 such residue detections per 100 samples, which seems like a lot of detections in violation of EPA standards. However, the tests are quite sensitive, and the residue amounts may be very small. USDA is not greatly worried: "In most cases, these residues were detected at very low levels and some residues may have resulted from spray drift or crop rotations." Environmental groups are not convinced. 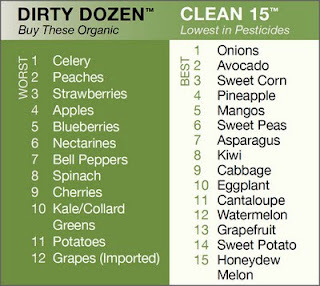 The Environmental Working Group uses these data as one of several sources in constructing its "dirty dozen" and "clean fifteen" lists of fruits and vegetables. I wish the USDA's PDP reports did a better job helping readers to understand the implications of residue detections for pesticides that have no EPA tolerance. If USDA's position is that these are negligible detections, attributable to inconsequential pesticide drift, then it should explicitly set a threshold for these negligible detections. On the face of it, without that type of interpretation, I am reluctant to accept that these detections are all inconsequential. For example, notice that 16% of celery samples and 14% of many leafy greens had this type of violation. Could those really all be spray drift? That would seem surprising. It would help to have a more blunt assessment from USDA experts: "These detections are negligible, but we want these other detections to fall into compliance in the near future." Also, the Environmental Working Group throws a good heavy punch this week regarding the produce industry's government-funded information campaign to convince people not to worry about pesticides. Agriculture departments, including the California Department of Food and Agriculture and USDA, should steer clear of anything that smacks of misleading propaganda on this topic. For example, now that I have had time to study the residue data, I suspect last November's report from the Alliance for Food and Farming is overconfident that these residues are harmless. A better approach might be to undertake some vigorous enforcement, drive down the frequency of violative residue detections, and then boast about the results. Indeed, if industry leaders took a long-term perspective, I think they would encourage USDA to do so. The entire U.S. population is exposed on a daily basis to numerous agricultural chemicals. Many of these chemicals are known or suspected of having either carcinogenic or endocrine-disrupting properties. The report identified several problems that hinder policies to address environmental chemical contaminants: (a) inadequate funding and staffing, (b) fragmented and overlapping agency authorities, (c) excessive regulatory complexity, (d) weak laws and regulations, and (e) undue industry influence. You may be interested to know about new sessions popping up the American Dietetic state affiliate conferences rebuking the "dirty dozen" and offering heavy criticism that this type of outreach deters consumers from eating fruits and vegetables. I began hearing about this session from some friends in Texas. ADA leading the pack towards progress. The session is called "How Risky is Our Food? Clarifying the Controversies of Chemical Risks" and the FoodInsight has done the same type of presentation on aspartame, caffeine, BPA, high fructose corn syrup and antibiotic usage in animal agriculture, food dyes and biotech. Dr. Wilde, I just wanted to say thank you for posting this summary of the 2008 data. I did a similar (although not as nice and succinct as yours) analysis of the USDA data, criticizing the EWG for their unnecessary alarmism which is based on poor data analysis and seemingly intentional misunderstanding of tolerances and lower detection limits. I think it is very important for people to know that fresh fruits and vegetables are, overall, safe foods, and that the benefits far far outweigh the risks. Any plans to post a similar summary for the 2009 data? It's on my to-do list, but I won't get to it until late July at the earliest. I do not see the "cocktail effect" addressed - the affect of one "safe" concentration on top of another "safe" concentration, etc. Nor a discussion of pregnancy, small children, compromised health complications, etc.